Can you travel with your medications? A common question, and we’ve got the answer! The big green pill every morning, a teaspoon of the liquid medication at night… Perhaps a dose of oxygen as needed. Health issues almost always come with a host of medications that can take away pain, help us breathe, lower our blood pressure, regulate a heartbeat, or help us manage even more critical issues. So what do you do when you need to pack up and go? Can you board an aircraft with your mini-pharmacy in tow? The short answer is “yes.” If you have been prescribed medications, you can certainly bring them with you on an airplane – and you should! While not required, it is a good idea to bring a copy of your prescriptions with you. In the case that there are questions, it is better to have the information handy. You know that pill box that helps you keep everything organized for each day of the week? Leave it at home, or bring an empty one with you to fill once you arrive at your destination. Your medication should be in its original container with your name on the outside – applied by the pharmacy where you purchased the medication. Keep all medications together and easily accessible in your carry-on luggage. It is a good idea to place them in a transparent bag, a one-quart sized storage bag if possible. Be ready to declare your medications at the security check-point. If your doctor has told you that your medication cannot go through x-ray screening, let the TSA staff know that your medication will need a different type of inspection. A note about a related topic – medical devices. Any snorers out there who don a c-pap mask at night to help you breathe better? Be sure to declare any medical devices in your carry-on luggage before you go through screening. The TSA staff will guide you through the screening process. If you are using an external medical device that is connected to your person, such as a neurostimulator, port, feeding tube, insulin pump or other device, please let the TSA staff know about it and where it is located. You may also, ahead of time, visit www.tsa.gov, and complete and print a TSA notification card that describes your condition. This is a tool available for your use, should you feel more comfortable giving information in written format. While not all-inclusive, this information is a good start to understanding what you need to do in order to bring your medications on-board an aircraft. Before your trip, consult the TSA website for more specific information about your specific items. When you take a flight to a nearby hub or sunny destination, you might notice that your aircraft always makes more turns than you’d think are necessary on the way. In fact, it’s almost unheard of for a commercial flight to fly in a straight line to its destination. So if the shortest distance between two points is a straight line (you’re welcome, math geeks), why are thousands of airplanes flying out of their way to get to their destinations? The answer lies in flight planning and air traffic flow. Before a commercial flight takes off, the crew must file a flight plan. This plan shows the route the aircraft will take from the departure city to the arrival city — kind of like setting the GPS navigation for a road trip. Similarly, in the same way that cars use roads to reach their destinations, aircraft must spend the majority of a flight along pre-planned routes. Every airway has its own name (just like Route 66 or I-40) and its own type (like interstates, highways or back roads). Airways below 18,000 feet (and that run directly between navaids) are called victor airways and those above 18,000 feet are called jet routes or jet airways. Newer airways that don’t run directly between navaids are called Q or T airways. Each airway is named by its corresponding letter (V for victor airways, J for jet airways and so on) and a number. For example, a flight plan that calls for the use of Jet Airway 6 will simply show J6. In situations where there’s no suitable airway for a flight to follow, like extremely short flights or the switching of airways that don’t intersect, the flight plan will go from one waypoint to another directly. One interesting fact about air traffic flow is that all westbound flights fly at even numbered altitudes (like 36,000 feet) and eastbound flights fly at odd numbered altitudes (15,000 feet, for example). In addition to flying along airways and between waypoints, aircraft entering and departing a busy airspace (such as Atlanta or Chicago) have to fly very specific arrival and departure routes known as Standard Instrument Departures (SIDs) and Standard Terminal Arrival Routes (STARs). Like on-ramps and off-ramps on the highways of America, these routes exist to safely and efficiently flow lots of aircraft into and out of busy airports. SID and STAR procedures are usually named after one of the waypoints within their routing and in many cases are creatively named with local relevance. Atlanta, for example, has a route named JCKTS 9, paying homage to the Georgia Tech Yellow Jackets and a route named “WARRR 1,” which overflies the campus of Auburn University, which has long used the saying “War Eagle.” You’ll notice that your flight into a hub city often takes a few minutes longer than the flight back to AVL because the STAR procedure into the hub typically requires a little extra flying to get all aircraft into one continuous line toward the runway. In this example of an Allegiant flight from AVL to Baltimore (BWI), you can see that the flight plan took the aircraft on a slightly curved route, which was about 80 miles longer than flying directly to BWI. Looking at the flight plan, next to “route,” you can see that the flight departed and made an immediate turn to the LUMAY waypoint, where it joined the Q58 airway and flew to the PEETT waypoint, where it then went directly to the THHMP waypoint to begin the RAVNN6 arrival into BWI. Whew! For the sports fans out there, we’d like to point out that the portion of this flight that began at THHMP was part of the Raven 6 arrival, which was named after the Baltimore Ravens football team. As intricate as all this routing information may seem, most flights can upload a flight plan to the aircraft’s computers with the push of a button. Most airport pairs have a pre-set list of routing options depending upon the location of those two airports. There is typically a primary option and various backup routings for different weather situations en route. Airports in less busy airspace do not have SID and STAR procedures unless issues, such as terrain (like mountains) require aircraft to fly in specific areas near the airport. When you fly from AVL you can bet that you’ll be flying a STAR when your flight approaches its destination and a SID when you leave that airport to return home. July 2017 was the busiest single month on record at AVL - for the first time in the airport's 56-year history, more than 100,000 passengers used the airport in one month. Specifically, 100,998 passengers were served by five airlines: American, Allegiant, Delta, Elite and United, an 11.6% increase compared to July 2016. Year-to-date, passenger numbers are up 15% compared to 2016 - setting the pace for another record year. "We have experienced three consecutive years of record passenger use," said Lew Bleiweis, A.A.E., executive director, "And the trend is continuing. It is exciting to see the airlines add service and seats in our market, and equally positive that travelers are using those services. The success is good for the airlines, good for the airport, and most importantly - very positive for our travelers. AVL continues to be one of the best connected regional airports in the U.S."
Growth at the airport can be attributed to several factors. First, the airlines continue to add seats in the market, and these seats are being used. The planes are full, and the demand for air service is outpacing the supply. Asheville and western North Carolina continue to grow as a popular destination, and the passenger numbers reflect this fact. "I would like to thank area residents for continuing to use their local airport," said Bleiweis. "We are proud to be the local gateway to and from the world, and are ready for continued growth." Asheville Regional Airport is nearing the completion of Project SOAR: Significant Opportunity for Aviation and the Region - an $80 million, four-plus year project resulting in a new (replacement) runway and additional taxiway to serve the region's aviation needs for decades to come. A 1,300-space parking garage is also under construction, and will be open by Thanksgiving. In another story, we correlated a flight’s radio call sign to a person’s nickname. The call sign doesn't belong to the airplane, it belongs to the flight that aircraft is operating; Delta 2308 for example. A call sign can be used by various planes in a single day, such as when one flight number has multiple segments (a segment is a single flight between two cities). If a call sign is a nickname, an aircraft’s tail number is its legal name. A tail number is an alphanumeric code between two and six characters in length used to identify a specific airplane. The alphabetical prefix of a tail number is indicative of an airplane’s country of origin. All United States-based tail numbers begin with “N,” Canadian planes begin with “C,” German with “D” and so on. The remaining numbers and letters are generally at the discretion of the owner, but in most cases will consist of a string of three numbers followed by two letters. Many airlines have a certain amount of continuity in the way their tail numbers end. 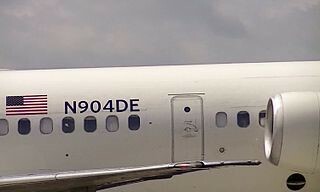 Delta, for example, has hundreds of tail numbers that end in “DL,” “DN,” or “DE.” The picture to the right shows the tail number of a U.S. registered Delta jet, N904DE. Most airlines use an abbreviation of the company name, one of the airline’s identification codes, or an abbreviation of the leasing company that owns the aircraft. All civilian aircraft must be registered with the aviation authority in its country of base, just as a newborn baby is given a name and social security number. For example, all airplanes based in the U.S. must be registered with the FAA. Every airplane has its own unique tail number, from the moment it’s assembled until that aircraft is retired and scrapped. Like a name, an aircraft’s tail number can be changed at various points during its lifetime, though this is a paperwork intensive process. All commercial aircraft are given a temporary tail number for flight testing before being delivered to an airline with a new tail number. Likewise, if an aircraft changes airlines or owners, the new owner may decide to change the aircraft’s tail number. Ironically, you’ll rarely see an aircraft’s tail number on its actual tail; they’re almost always painted on the rear fuselage, or even on the engine of an aircraft with rear-mounted engines. In some countries, tail numbers have also been painted on aircraft wings for decades, though that has become uncommon in the U.S. 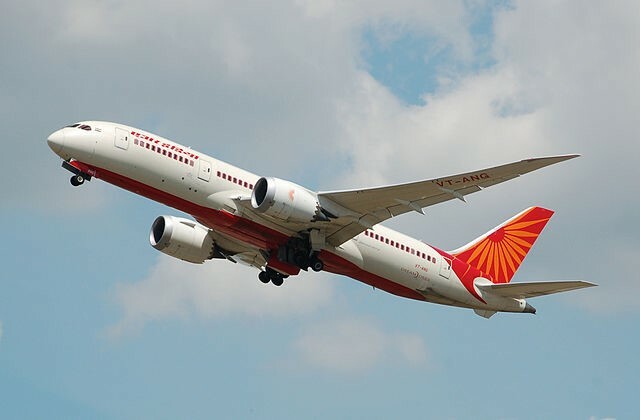 This image shows an Air India Boeing 787 with its tail number painted on the rear fuselage and on the bottom side of the wing. Like someone’s name, a tail number is part of an airplane’s public record forever. Your name is tied to where you were born, your family, where you’ve worked, studied and lived. A tail number tells an equally detailed story of an aircraft’s past owners, locations and maintenance records. If you happen to catch the tail number of the next airplane you’re boarding, Google it. You may be surprised by the places your airplane has seen! Starting July 14, 2017, there will be new ambassadors at Asheville Regional Airport. These volunteers will have four legs, wagging tails and lots of affection to share with passengers and visitors. They may even share a few kisses. Their names are Grace, Sam, Doc, Sunny, Daisy, Baby, Jelly, Willa and Brody. And these ambassadors are part of a new program called "Paws for Passengers," in which pet therapy dogs and their handlers will meander through the airport terminal during busy times each week. The pet therapy dogs are mild-mannered, friendly and trained companions who enjoy visiting with people of all ages, and their handlers have hearts of service. "When asked why we started this new program at the airport, I immediately think about our region and how pet-friendly we are," said Lew Bleiweis, A.A.E., Executive Director. "It is a good fit for Asheville Regional Airport to have this program that allows certified pets in the terminal to help bring some cheer, welcome locals and visitors, perhaps calm some nerves and provide a unique passenger experience." The program currently has eleven volunteer handlers and nine pet therapy dogs, from Labradors and a miniature Greyhound to rescue dogs of various mixed breeds. All dogs and handlers are trained and certified by either Therapy Dogs, Inc. or Pet Partners, both national organizations committed to training, testing and certification, regulating, insuring and registering therapy dogs and their volunteer handlers so they are prepared to visit public places. The volunteers have also participated in an in-depth airport orientation and training, and will be part of the Guest Services volunteer team. "We are excited to join the small but growing list of airports that offer pet therapy programs," said Tina Kinsey, A.A.E., Marketing & PR Director. "Our program is the only one offered at an airport within two hours of AVL, and is just one more way we are focusing on passengers." For more information about the program, including the application to become a Paws for Passengers volunteer, visit flyavl.com. 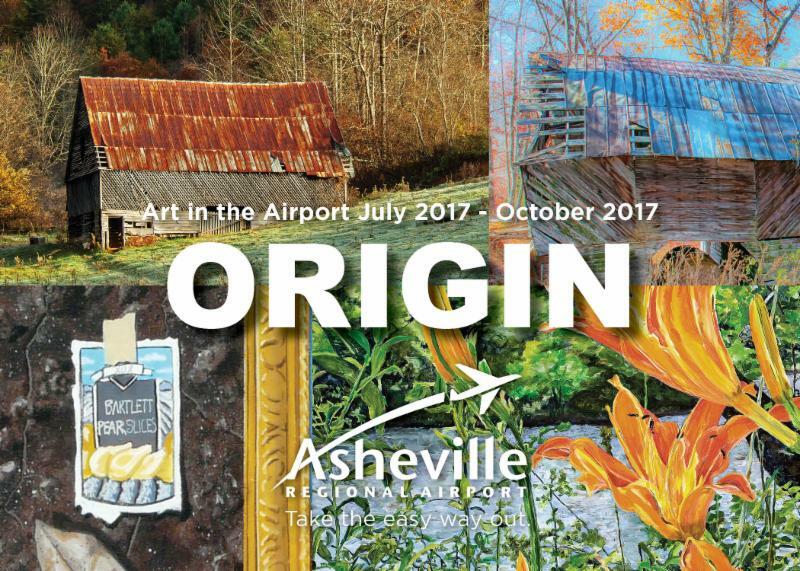 (Asheville, N.C.) The Art Gallery at Asheville Regional Airport (AVL) unveiled a new exhibit, Origin, on display through October 29, 2017. The exhibit features artwork from four artists whose work reflects the western North Carolina region. Acrylic paintings by Kim Rody Kopp welcome summer to the mountains with her use of color in vibrant statement pieces, capturing views from the area. The archival photographic prints by Bonnie Cooper and Dan McGowan strategically document a piece of the heritage of WNC. Paul Karnowski's canvases leave the viewer considering the dynamics between where things begin and end. Whether Asheville is one's origin or destination, the exhibit at the airport gallery delivers a bright and thought provoking showcase. Origin invites travelers to take a glimpse of the area through a new perspective. Did you have a cool nickname as a kid? Maybe one of your friends did. We all know someone with a longer name that prefers to go by an abbreviation or nickname. When it comes to radio communications, airlines work exactly the same way. Every airline has its own call sign for use in radio communications. Any given flight will be known over the radios as its airline call sign followed by that flight’s number — Delta 993 for example. A commercial flight will use this call sign from the scheduled departure gate to the scheduled arrival gate, even if that flight diverts or needs to make a stop for any reason. If an aircraft is not part of an airline or air carrier’s fleet, then it will be identified by its aircraft type and tail number by Air Traffic Control (ATC). Also, the phonetic alphabet is used globally in aviation, for consistency. Instead of just saying “A” you’d say “alpha,” and “N” would be “November” and so on. A Learjet with the tail number N45LJ would be referred to as “Learjet 45 Lima Juliet.” Most smaller general aviation aircraft and business jets are identified this way. If you think about it, the way in which airplanes are assigned call signs is no different from the way people get their nicknames. Sometimes people will shorten their first name and other times they’ll go by their middle name or something that represents them. Other times, they’ll just make something up! Delta, American and United each keep it straightforward by using only their airline’s proper name as the call sign, but some airlines have had very creative call signs over the years. Check out these examples — some of which are from airlines that have since merged with other airlines, but the nicknames still retain their cool factor! Two of the more unique and creative call signs flying in the U.S. today actually belong to Trans States and Republic Airlines — two regional airlines. Republic flies regional jets for Delta, United and American. This Indianapolis-based airline uses the call sign “brickyard,” paying homage to the iconic Indianapolis Motor Speedway — aka “The Brickyard.” Trans States flights use the call sign “waterski.” Yes, waterski, the aquatic activity. This call sign dates back to the airline’s beginning in 1982 as a tiny carrier named Resort Air that primarily carried passengers to the Lake of the Ozarks in Missouri. Call signs, like names, come in all shapes and sizes but they’re each unique to one airline or airplane. In a way, they’re even more unique than a personal name because at no given time will there ever be two planes in the air with the same call sign. The call sign system is just one of the many structures in place to keep air traffic flowing smoothly and safely. Do you ever pay close attention to the writing next to the door when boarding an aircraft? While you booked on Delta, American, or United, you’ll see things like “operated by PSA” or “operated by ExpressJet” painted near the nose of many flights you take. These flights are operated by regional airlines. Regional airlines have been around since the dawn of commercial air service and continue to be a large and vital part of the airline industry, including here at AVL. Technically, almost every airline before the jet age began as a regional airline. In the early days, airlines didn’t have hubs designed to connect passengers from various flights, and instead flew long routes with multiple stops along the way. Even early cross-country flights made dozens of stops along the way, allowing passengers to travel regionally or coast-to-coast. Can you imagine booking a flight to California… but stopping in eight or nine cities en route? So what changed between then and now? Prior to 1978, the government regulated all domestic interstate airline routes, controlling which airlines could fly where, and even their schedules and fares. All this changed in 1978 when the Airline Deregulation Act essentially made the airline industry a free market. This resulted in many existing airlines focusing operations in a few key cities, thereby leading to the formation of the very first airline hubs. There were also dozens of new airlines being created all across the United States. Many of these airlines chose to operate smaller airplanes (in the nine- to fifty-seat range) and focused on connecting smaller cities with major cities and the newly forming airline hubs. Some of these smaller regional airlines of the 1980s laid the foundation for the regional airlines of today. Today, regional airlines largely fly on behalf of larger airlines like American, United or Delta. They generally fly regional jets and turboprop aircraft with 76 seats or less, and are flown on routes where larger aircraft wouldn’t be as economically viable. These routes often include flights to smaller cities from hubs and flights between lucrative business markets that demand high frequency. Larger airlines don’t fly these planes themselves because their cost structure is built around flying and maintaining much larger airplanes. Some of these regional airlines are wholly owned by a major airline and others are private entities. Most of their flying is dictated by the major airlines for which they fly. In these scenarios, an airline like Delta will pay a regional airline like ExpressJet to fly routes on its behalf and with its brand. The aircraft will say Delta, your ticket will say Delta, you’ll use a Delta gate and the flight crew will welcome you aboard a Delta Connection flight, but the flight itself may be operated by ExpressJet, Endeavor, SkyWest, or other regional airlines. Each of the 3 major airlines brand the flights operated by their regional partners as Delta Connection, American Eagle, and United Express, respectively. Without regional airlines, today’s airline industry would look very different. Airports like AVL would only have three or four flights to Atlanta and Charlotte on bigger airplanes, instead of double that frequency on smaller jets. Statistics have shown that increased flight options leads to increased travel in cities our size, which is great not only for that trip you’re planning, but also for bringing more visitors (and more visitor spending) into our region.Do you ever pay close attention to the writing next to the door when boarding an aircraft? While you booked on Delta, American, or United, you’ll see things like “operated by PSA” or “operated by ExpressJet” painted near the nose of many flights you take. These flights are operated by regional airlines. Regional airlines have been around since the dawn of commercial air service and continue to be a large and vital part of the airline industry, including here at AVL. Without regional airlines, today’s airline industry would look very different. Airports like AVL would only have three or four flights to Atlanta and Charlotte on bigger airplanes, instead of double that frequency on smaller jets. Statistics have shown that increased flight options leads to increased travel in cities our size, which is great not only for that trip you’re planning, but also for bringing more visitors (and more visitor spending) into our region. If you’ve ever had the opportunity to listen to Air Traffic Control (ATC) communicating with pilots over a radio scanner, you’ve probably thought they’re speaking in some English-hybrid, coded language. In many ways, you’re right. While English is the globally accepted language for ATC, there are many special codes and terms that are used in aviation, such as the phonetic alphabet (Alpha, Bravo, Charlie, Delta, Echo, and so on). This allows consistency worldwide as flights move through numerous airspaces and speak to multiple controllers throughout their journey. Even on the shortest of flights, your pilots are likely talking to no less than seven separate air traffic controllers from gate to gate. On longer flights, this number could easily double. This happens because each controller is typically only working one section of an airport, or one sector of an airspace. During the preflight procedures, often before boarding is even complete, your pilot will contact Clearance Delivery, known as “Clearance.” The pilot radios the clearance controller with their flight number and destination and the controller replies that they’re cleared to the destination as their flight plan indicates, or if there have been any changes implemented to their flight plan by the FAA. Clearance also often gives the pilot an initial altitude to expect after takeoff, the cruising altitude to expect and the frequency they’ll need to contact the departure controller after takeoff. When traveling to a busier airspace, clearance may also give the pilot a specific window of time during which to takeoff in order to arrive at the flight’s pre-sequenced time. When your flight is ready to leave the gate, your pilot contacts Ground Control, known simply as “Ground.” The ground controller will give them permission to push back onto a given taxiway or another designated location. Ground controllers are responsible for all movements along airport taxiways. At busier airports like Atlanta or Charlotte, the ramp areas (the paved area between gates and taxiways) each have their own controllers that direct the movement of airplanes into and out of gates. After being cleared by ramp or ground controllers to push back and doing so, the pilot notifies the ground controller when he or she is ready to taxi to the runway and is given clearance to do so. Here at Asheville and in other mid-sized airports, your departure runway will always be dictated almost exclusively by wind direction. Aircraft always takeoff and land into the wind, as best as the runway layout of an airport permits. At busier airports with multiple runways, the direction into which you’ll be exiting the airspace also determines the runway to which you are assigned. For example, when departing Atlanta and heading north, west, or any direction in between, flights generally use the runway on the north side of the field. South and eastbound flights use the southern runway. When nearing the end of the departure runway, the pilots switch from ground to Tower Control, commonly known as “tower” and notify the tower controller that they’re prepared to depart. Tower controllers are the controllers that most everyone is thinking of when they think of ATC — thanks in part to films like Pushing Tin. Tower controllers are positioned in an airport’s control tower and are responsible for all movements on an airport’s runway, which mostly consist of takeoff and landing clearances. Takeoff clearance usually includes a heading (direction) to fly, or a waypoint (invisible directional marker) to turn towards, along with an initial altitude to climb to and not exceed. Center control facilities house numerous controllers and are responsible for controlling aircraft that are en route over large regions. There are only 20 centers to cover all of the U.S. airspace. A flight from AVL to Charlotte will only communicate with Atlanta Center, but a flight to Chicago will communicate with Atlanta, Indianapolis and Chicago Center while enroute. Once your flight has contacted center, they are cleared to their final cruising altitude, traffic permitting. Center is responsible for your flight until you’re close enough to your destination’s airspace to be handed to the approach controller. At this point, the entire progression of controllers essentially goes in reverse. Through approach, landing, taxi and parking, your pilots will communicate with Center, Approach, Tower, Ground and possibly Ramp — in that order. While this may seem like an intricate web of communication, most transmissions are very brief and odds are your flight will never have to deviate from its original flight plan in any way. Between flight-planning technology, aircraft navigation abilities and aircraft sequencing technology, most adjustments that controllers do have to make are minor, even in the busiest of airspaces. Controllers are yet another piece in the system that keeps air traffic moving safely and efficiently around the world! AVL. We use it all the time. Fly AVL. FlyAVL.com. Facebook.com/FlyAVL. @FlyAVLnow on Twitter. You probably know that AVL has something to do with the airport, and you see it on your bag tag, but what does AVL really mean? What’s an “AVL”? AVL is our airport’s identification code. All airports are known in aviation, largely, by their code. Airports are assigned codes by the International Air Transport Association (IATA) and the International Civil Aviation Organization (ICAO). In the United States, the Federal Aviation Administration also assigns or acknowledges a code as an airport’s location identifier. These codes are used for many purposes, from flight planning to record keeping. IATA codes are three characters in length and ICAO codes are four characters, with the first being a country or region identifier. Most U.S. airport codes begin with the letter K, Canadian airports the letter C, Europe the letter E and so on. In Asheville’s case, our codes are AVL and KAVL, respectively. 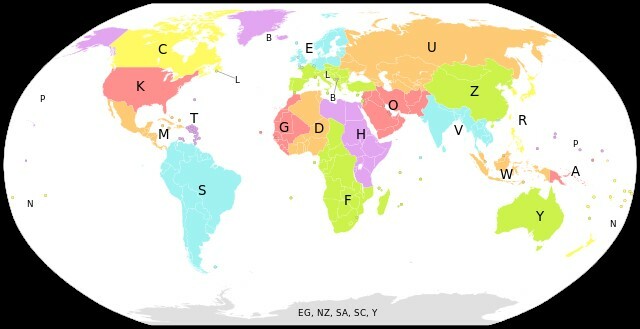 The picture below shows every region around the world and its corresponding prefix under ICAO standards. Generally, airlines use the IATA codes to identify airports when presenting them in public places; like their websites and reservation systems. The ICAO codes are used for navigation and flight planning purposes. This probably has to do with the fact that most IATA codes are common-sense oriented, whereas ICAO codes are less straight forward, especially in other countries. Internationally, it’s normal for an airport’s IATA and ICAO codes to be completely different from one other. London Heathrow is known to IATA as LHR (which most frequent travers are familiar with) and to ICAO as EGLL. Charles De Gaulle airport in Paris is known as CDG to IATA and LFPG to ICAO. If you happened to fly to Charles De Gaulle, your ticket and baggage tag would say CDG, but the flight plan would be filed with “LFPG” as the destination. The IATA codes are often very easy to associate with the name of the airport. Many frequent travelers can quickly make sense of codes like LHR, CDG, FRA, AMS, and so on. Their ICAO counterparts of EGLL, LFPG, EDDF, EHAM… not so much. In the U.S., most airports’ IATA and ICAO codes are the same, with the exception that the ICAO code adds the “K” at the beginning. There are rare exceptions, though, such as the Branson airport, which is known by IATA as BKG and ICAO as KBBG. There are a fair number of exceptions, each with its own interesting story that often ties a seemingly bizarre code back to its original meaning. The next time you pick up your luggage from baggage claim, take a look at the codes on the tag. Odds are, you’ll recognize what you see, but you just might discover a new one. There are also a handful of websites (like this one) that tell some of the interesting stories about the origins of specific airport codes. While we’re on the subject, here’s a useful tip every traveler should know: When you’re booking travel online, you can generally enter the airport code in the “departure city” and “arrival city” fields to speed your search process — if you know the codes! We might be biased, but we think the most important one you need to know is AVL!